Most people think of Singapore as a concrete jungle that is in the tropics, with beaches concentrated mainly at East Coast, Changi and Sentosa. 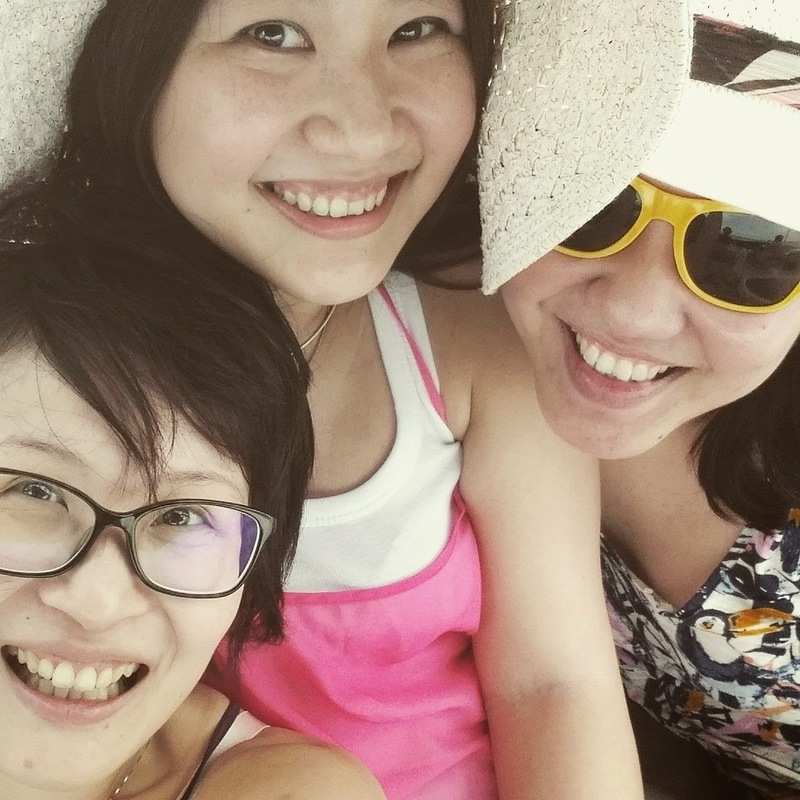 There are a lot of smaller islands away from Singapore mainland that's worth exploring in a day trip; simply gather a group of friends and rent a yacht for the day. It costs around $1,200 to rent one for the day but there are quite a few Groupon/All Deals Asia deals that go for about $500 for a day. That works out to be about $50/pax and that's relatively affordable. Of course, there are some alternatives which I will mention later. That's the yacht that we went on, thanks to Moon who won a trip from a Facebook contest held by the Neo Group. There were a total of 15 of us and we catered food from Neo Group (as part of the T&Cs) but if you rented from other companies, they usually allow you to bring your own food and some even have portable BBQ sets and you simply bring the raw foods. We started our journey from the marina of ONE°15 Marina Club onboard PromiseOne. It was a very nice and sunny day but yet windy too! Glad that the weather cooperated with us to give us this lovely day to go yachting! Other possible places to set off from are: Raffles Marina (that's in Tuas) and Keppel Island. Really depends on where you rent the yacht from. I'm so happy that I finally managed to wear my Kate Spade Saturday sunglasses...on a Saturday no less! We set off towards Lazarus Island, which is further south from Sentosa and this is the first island that I'm going to introduce. 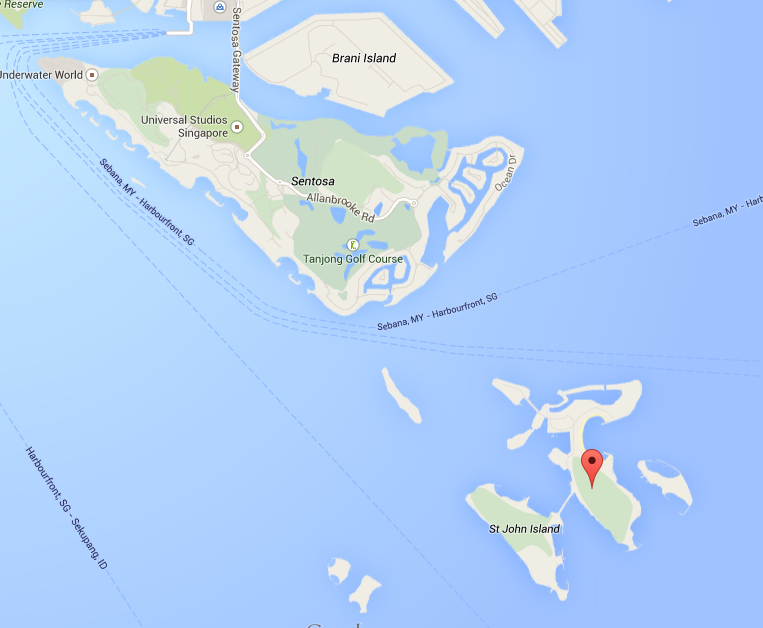 Lazarus Island (the one with the pin) is one of the 8 islets south of Sentosa and it is connected to St. John's Island by a concrete bridge. Some smaller islands are now part of an extension of Lazarus Island thanks to the Singapore Tourism Board's plans in 2000 to develop it after Sentosa. So...better go and visit it before STB fully develops it and it turns from an unspoilt treasure into a manicured replica of it's larger sister. Some boats choose to dock near the beach and some kayak to shore but the water was a little choppy so we decided to dock at the calmer lagoon where the proper jetty is located. I liked the idea of using corals and seashells into the pavements. Quite rustic and environmentally friendly, no? How difficult is it to get a toddler to be in a selfie with you? Apparently, very difficult. Especially if said kid is more interested in playing with the sand and wondering where his father is walking to. Now...this is what I love most about Lazarus Island - the beach! The sand is super fine and soft, the water cold and not a lot of people on the beach. There aren't any stores selling drinks so please remember to pack your own food and water. This spot is perfect for a short picnic and dip into the sea. Bring a tent if you want some respite from the sun but some people were quite creative and made make-shift tents with their beach towels. I'm planning to come back another day just to Lazarus Island to picnic, swim, maybe kayak and just chillax. Remember to bring loads of sunblock and check out the weather forecast before your trip! After our lunch and island exploration, we headed off to Kusu Island. The island isn't very convenient for pleasure boats because the jetty is more suited for the larger boats. So, if you want to visit Kusu, I suggest taking the regular chartered ferries from HarbourFront terminal (about S$15 for adults and operated by Singapore Island Cruise). 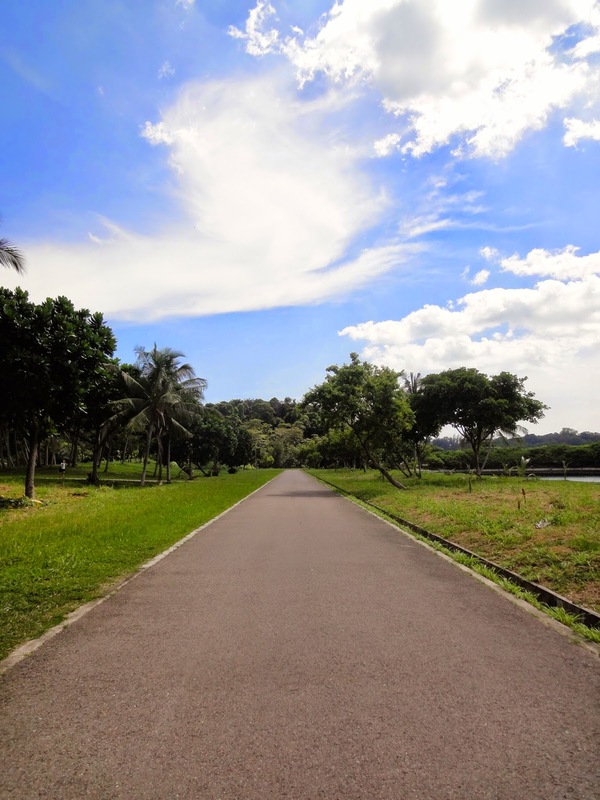 If you want to hang out with turtles, wild monkeys, insects and be in a nice park with almost no beach. Kusu Island is super crowded during the 9th lunar month (around October) so please check in advance whether pilgrims will be making their way down to the temples there first. If you're one of the pilgrims...then...erm...you should know when is the best time to visit. If you're like me and hate crowds, avoid the 100,000 devotees and make your trip to Kusu Island during other months. Thanks to the STB plans, Kusu Island is starting to look very manicured and there are a lot of 'huts' for people to sit and picnic. The temple on the lower grounds look a bit HDB-ish too. Despite its park-like appearance, overnight camping is not allowed on the grounds. Thank goodness for this because as it is, it is a bit irritating that the government is capitalising on the religious activities and tourism aspect. Shouldn't the actual island dwellers have some say? Kusu literally means turtle and legend has it that a giant turtle turned into the island in order to save 2 shipwrecked sailors. Thus, turtles are considered to be something semi-sacred on this island and all of us were very excited to see our first giant turtle at the wishing well! There were many other turtles in the shallow sea bed. The temple keeps terrapins too! There's a small pool within the temple for these terrapins to swim or just lie down. A lot of people throw coins into the wishing well, thinking that it'll fulfil their wishes while donating to the temple. However, the late temple caretaker, Madam Sim, said in an interview in 2007 that it's actually owned by Sentosa ergo the government. Hence, none of the money collected goes to the temple. Another government initiated modernisation is the building of this food centre which is very empty on normal days. I reckon that it's only filled during the 9th lunar month where devotees make their annual pilgrimage. There are 2 religious sites on Kusu Island. 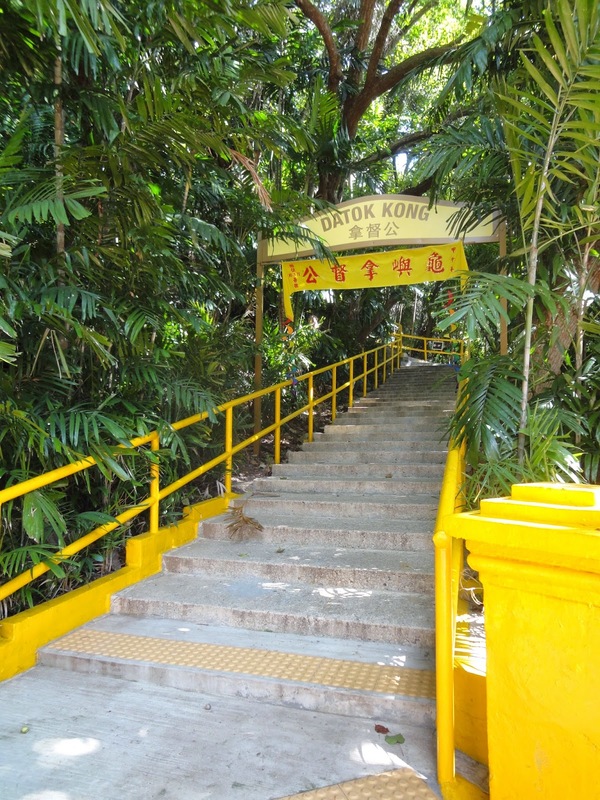 The first one that you see when you arrive is the Dua Pek Gong (pronunciation in Hokkein) temple. The 2nd religious site is the Kusu Kramat which is up on the hill. 152 steps. Ok...I gave a miss because I was thirsty. I guess I should've done the trip considering that this was my first visit to Kusu. Oops. The resident monkeys are wild so beware. Don't feed them nor approach them because they're not friendly. Good thing is that they're not as spoilt as those on the mainland so they do not know that your bags contain food etc. However, please do not train and encourage such behaviour. Keep your food secured. 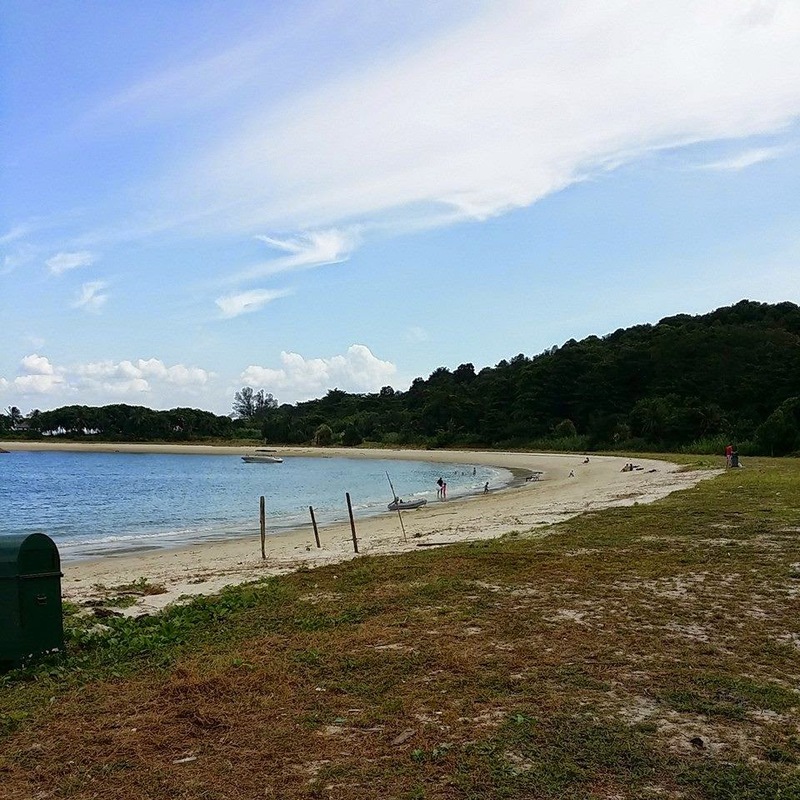 Since Kusu is originally a reef island, there is a small lagoon where some tourists enjoy sunbathing but honestly, the beach at Lazarus Island is a lot nicer. More trips await me! Uh oh...I need to find people who share similar interests...I can't afford to go out on a yacht trip to these islands all by myself.